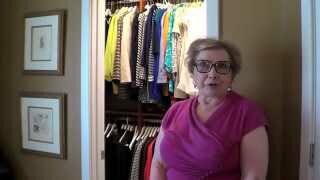 Kathy, a local resident of Arlington, Virginia shares her amazing experience of her custom closet organization and designed master closet with Closet America. Here at Closet America, our goal has always been to provide our customers with top quality organization systems and a fantastic experience from start to finish. We measure our success not by profits, but by how happy our customers are. 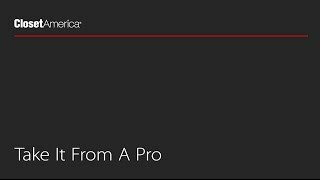 Luckily, we are very rich in customer satisfaction, as the following customer testimonial videos show. See how our recent customer, Sue, describes her "toast-worthy" wardrobe designed and installed by Closet America! "They analyzed my current situation, asked good questions, and then presented me with some suggested layouts for my closets. We worked together to develop the final plan. The installation was efficient and completed in 4 hours. I am very happy with the final product and my closets have so much more space than I realized I could have!" "Greg, the installer, showed up early and did a quick and professional job and was able to finish ahead of time. Great job of cleaning up too." "I was most satisfied with the installation crew and the quality of the work. The crew was on time, professional, neat, knowledgeable, and friendly. The quality of the work is like nothing I have ever seen before, in a positive context." "I was most satisfied with the installation off the product. They were quiet, clean, efficient. They finished early, and it looks beautiful." "The craftsmanship of the wood is beautiful and the installers were very professional." "I was satisfied with the end product. My closet is beautiful and it is exactly what I wanted." "I would highly recommend Closet America. Both the salesperson and installers did a great job. The whole experience was pleasant. That doesn't happen a lot in this day and age."